All over the United States, and especially in larger cities like Orlando, rideshare companies like Uber and Lyft have fundamentally changed getting around. However, their relative newness means that laws surrounding their operation are still being fully fleshed out, which can leave injured passengers at a loss if they are in an accident. Even now, nearly a decade after Uber’s inception, too many individuals remain unaware of certain facts they should know before they ride. While regulations on companies like Uber are ever-changing, there are pronounced differences in how Uber is permitted to operate, versus how companies that run taxis or buses do. For example, taxi drivers in Florida are individually required to maintain insurance in the same amounts as private drivers, but rideshare companies must also hold insurance policies (in addition to their drivers’ individual insurance) in the amount of $100,000 for bodily injury or death if a passenger is not in the car in question, with the amount jumping to $1 million if someone is on board. Taxi drivers are also subject to more specific rules, depending on the locale they operate in; for example, some cities have dress codes for drivers. They also must be tested for drugs and alcohol on a regular basis, while as of this writing, many rideshare drivers do not have to undergo such testing, though Florida’s 2017 rideshare bill does mandate background checks. While these differences have engendered significant disagreements and legal wrangling between taxi companies and rideshares, the crux for consumers is that any accident in a rideshare car will play out differently than it would in a taxicab. Like in any other accident, your first line of attack in an auto accident case is to contact the driver’s insurance company regarding coverage, if they were at fault. 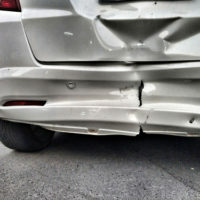 It is generally a good idea to contact the insurance company of any other driver involved in the collision, as well – for example, if your Uber driver is rear-ended by another car, that driver would be more at fault than anyone else. You would have to show that you were injured more severely than mere cuts and bruises, and that your injuries were directly caused by the offending driver’s breach of the duty of care owed by all motorists. Do not neglect your own insurance coverage, even if you were the passenger in an Uber or Lyft and did not cause the crash in any way. Many new Floridians especially, but people in general, forget that in Florida, auto insurance follows the person, not the vehicle – in other words, if you have Personal Injury Protection (PIP), you can, if nothing else, seek compensation and recovery under your own policy. Any method to obtain compensation is a good one if the alternative is receiving nothing. While Uber, Lyft and the other rideshare companies have been around for years, it is only now that the law is beginning to catch up with their operations. If you are involved in an accident with a rideshare car, you will generally have options under which you can ensure your medical bills are paid. If you need help in enforcing this, the Orlando auto accident lawyers at the Hornsby Law Group are happy to meet with you and try to help answer your questions. Call our office today to set up an initial appointment.